Michael A. Scaddan is an international educational consultant who works in the USA, Australasia, Asia, and Europe. He is the author of 40 Engaging Brain-Based Tools for the Classroom as well as 24 training manuals and 3 educational DVDs. He has a background in elementary and adult teaching as well as being a highly successful principal and was recently selected as patron for The Hungarian Brain Based Institute. As a school principal, he continued to be a practical, hands-on educator, teaching all levels of children through an innovative Learn to Learn program. This enabled him to develop hundreds of useful and practical classroom tips as well as fine-tune successful schoolwide techniques that are now passed on to fellow educators. Always looking for a better way, he has extensive training in brain-compatible learning, completing an MEd in accelerated learning at the University of Tasmania. 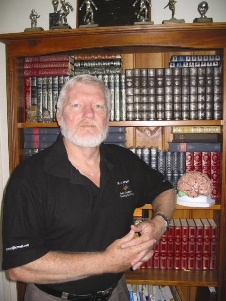 Scaddan is now CEO of Brain Stems Ltd., a brain-compatible training organization, and has worked as a full-time learning consultant in the USA, Sweden, Hungary, India, and Australia, as well as throughout New Zealand. He has recently been employed as an educational consultant to the government of Thailand.